Rice charms are unique in respect that they are designed by you personally. Ordering is easy and you will be given different options during the ordering process. Prior to ordering, decide what names or text you would like, please follow the guidelines below. 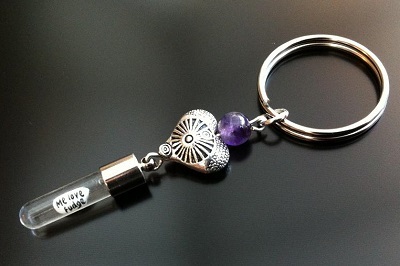 After choosing a design, decide if you would like a key ring, necklace, bag charm or bracelet, then leave the rest to us. The first name or line of text is with our compliments, additional lines of text or a heart is charged at £1.00 per line. The text boxes in the ordering section generally allow you to write up to 9 characters per line of text, including spaces. If the names or words chosen are more than 9 characters per line, like Christopher or Anniversary, or if your wording seems to exceed 4 lines, please contact us with your text prior to placing you order and we will advise the best way to achieve your desired effect. Use the above only as a guide, but more importantly, be inspired. Also ask yourself if certain phrases or quotes can be shortened, for example Happy 21st birthday, can be shortened for greater impact or visibility to Happy 21st. Get pen and paper and play around with words. Once you have chosen your text, decide if you would like a key ring, necklace, hand bag charm or bracelet, then select your rice charm. There many beautiful designs in our range, from simple gemstone charms, to more elaborate designs with butterflies and angel wings. When choosing a chain you will have the option of silver plated or upgrading to Italian sterling silver. Each finished piece comes with complimenting pouch and will be posted securely by recorded delivery.